There are two ways to approach an 0-22 season. You can simply admit defeat or you can pay attention because you know there’s nowhere to go but up. Steve Richard (@srichardv) chose the latter, and has gone on to become the Chief Revenue Officer of ExecVision, a company that provides executives with the conversion insight and tools they need to help drive performance. Fresh out of Georgetown, Steve’s quest to join his classmates on Wall Street was short-lived, but purposeful. It was then he interviewed with a whopping 22 companies and didn’t get a single job offer. It was then, right out of the gate, he hit rock bottom. And it was then that he decided that would not be the end of his story. Instead of giving up, Steve changed gears and focused his sights on sales. It didn’t take long before he started getting offers at every interview, including a company that sells pre-cast concrete to prisons. (a role he opted not to take). 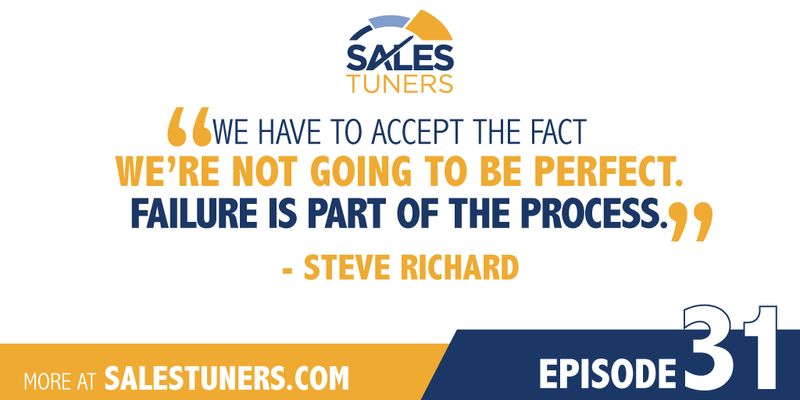 Today, Steve says his life’s work is helping sales professional become wildly successful. The father of four has started three companies dedicated to the betterment of sales organization, a goal he personally and professionally upholds at ExecVision. He hates to lose, which is both ironic and fitting given how frequently he says he has failed in his career. For that reason, failure is the foundation upon which he’s built his winning philosophy: if you learn something from it, it was meant to be. Failure Is Part of the Process: No one remembers the deals they win; they remember the deals they lost. There is a psychological reason for this that is rooted in the scientific makeup of the mind. When emotions are extremely high or there is a high level of anxiety, our brains are essentially programed to make us remember those moments. Instead of letting those moments haunt you, turn them into opportunity. Once you accept that mistakes happen and move on, it’s easier to choose to learn something from almost any sticky situation. You Determine How Successful You Become: It is much more common to fail at the start than it is to become the next overnight success story. What you do with that knowledge determines the path you will take. It’s up to you to decide. You own your own development. If you fail, own it because if you don’t fail, you’re never going to learn. Focus on One Thing at a Time: Make time to review calls either on your own or as a team. Instead of repeating the same mistakes over and over and expecting different results, review your calls, find out what works, and focus on one thing at a time and put it into practice.